Hey, everyone! In our last development blog post, we talked about tackling bounty assignments. The universe has a surplus of criminals to round up, and you can take assignments to track them down via the new Bounty Board! 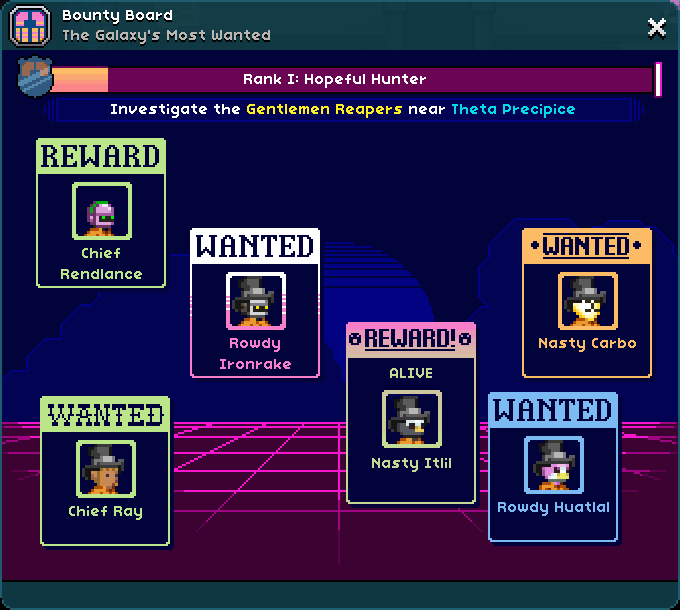 The Bounty Board shows you which gang you have been assigned to tackle, as well as showing you the current targets available to you. At any given time, you’ll be assigned to investigate one criminal group and their activities in and around a particular system. Once you work your way up their ranks and take down their leadership you’ll move on to a new, more challenging set of villains in a new sector. As you turn in more and more bounties, your rank will increase which will grant you better bounties and more rewards. I wonder what kind of assignment is in store for top level bounty hunters?